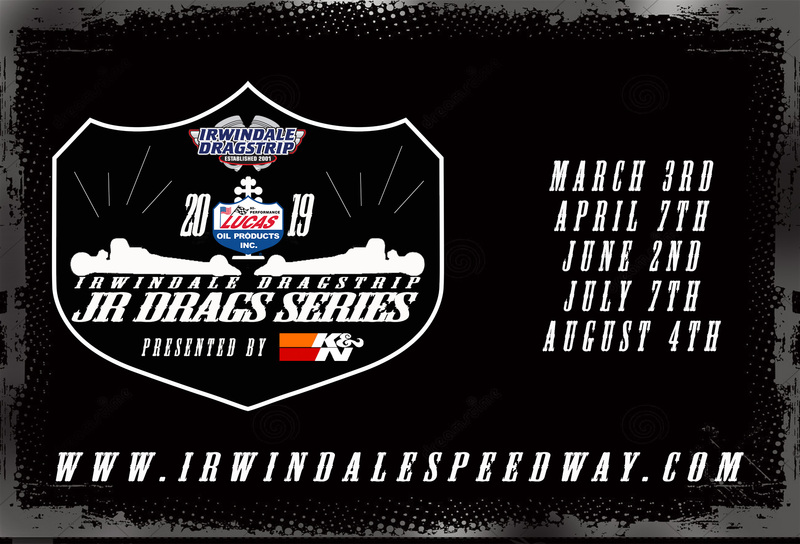 Irwindale, CA – Irwindale Speedway and Dragstrip is excited to introduce the 2019 Lucas Oil Jr Drags Series. The series will consist of 5 rounds of Junior Dragster racing. Running alongside the Summit ET Race Series, competitors in the Jr Drag Series will get to learn first hand what it takes to compete as they get older and advance the NHRA Ranks. Lucas Oil will serve as the entitlement sponsor. Lucas will provide product to the Junior competitors as part of a track partnership that returns in 2019. K&N Filters will serve as the presenting sponsor and will provide trophies for all class winners as well as a runner-up plaque. Hoosier Tire has agreed to come on board to provide tire support as a contingency sponsor. The opening round of the Lucas Oil Jr Drag Series at Irwindale Speedway will kick off on March 3rd. Dates will be easy to remember as they first Sunday of each month. Round 2-April 7, Round 3-June 2, Round 4-July 7 and the final August 4th. Series Points Championship will be tabulated based on the BEST 4 out of 5 rounds. Race Day schedules will be posted one week in advance. Classes will include: 6-9 Year old, Jr. Comp, 10-12 Year old, 13-14 Year old, 15-17 Year old. Entry fees will coincide with the Summit ET Series, just $55.00 for tech cards, $10 for spectators and crew. Each Sunday event falls the day after a Saturday Test N Tune which costs just $30.00 for a tech card and $10 for spectators/crew. Overnight Camping will be allowed for those interested in coming out on Saturdays. An additional $20 Camping Fee per RV/Trailer will be ensure proper security for those in need of leaving in the middle of the night. Irwindale Speedway and Dragstrip was established in 1999. Heading into the twentieth year, Irwindale Speedway remains the only speedway and dragstrip in Los Angeles County. With partnerships such as LKQ Pick Your Part, Lucas Oil, K&N Filters, Hoonigan, Clean Out Plumbing, Wood Electric, Jan’s Towing, Pepsi, Miller Coors, Hoosier, and Crazy Cuisine we are committed to providing a legal racing venue for the next generation of auto enthusiasts.